On December 15, 2011, honoring the 70th anniversary of the fall of Bataan and the subsequent death march, Senator Tom Udall (D-NM) proposed S. 2004, legislation to grant the Congressional Gold Medal to the troops who defended Bataan during World War II. 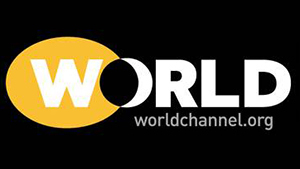 The next day, Congressman Martin Heinrich (D-NM) proposed its counterpart in the House of Representatives – H.R. 3712. One inspiration for this action was the documentary TRAGEDY OF BATAAN. 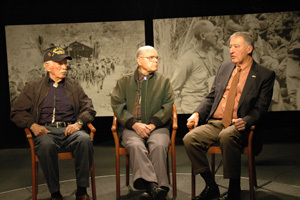 New Mexico PBS has produced a program with some of the NM survivors of the surrenders of Bataan, incorporating the original documentary TRAGEDY OF BATAAN. 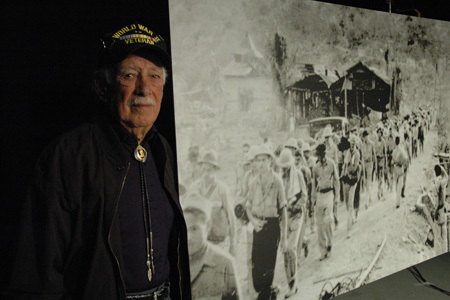 Bataan Survivor Pedro “Pete” Gonzalez next to a photo of the Bataan death march. Gonzalez is in the photo – foreground, left, in black pants). 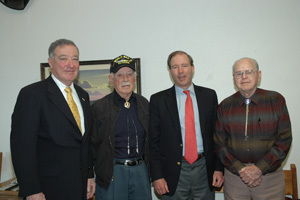 Left to right: Edward D. Baca, Lt. Gen., USA (Retired), Pedro “Pete” Gonzalez, Senator Tom Udall (D-NM), and William Overmier. Gonzalez and Overmier are two of the last remaining Bataan defenders. Left to right: Pedro “Pete” Gonzalez, William Overmier, and Edward D. Baca, Lt. Gen., USA (Retired). Gonzalez and Overmier are two of the last remaining Bataan defenders. 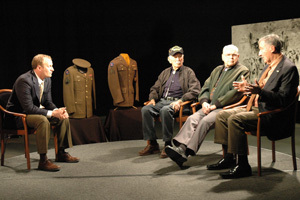 Left to right: Matt Grubs, NM PBS, Pedro “Pete” Gonzalez, William Overmier, and Edward D. Baca, Lt. Gen., USA (Retired). Gonzalez and Overmier are two of the last remaining Bataan defenders.